The cost of single-day passes to go skiing or snowboarding on Bald Mountain has again increased this year, with lift tickets during regular season costing $99 for adults, compared to $95 last year. Sun Valley Resort charges three different price points for lift tickets, depending on the time of year. There is a regular season, peak season and value season. Value season dates will be from Nov. 28 to Dec. 15 and March 31 until the end of the season. The peak-season dates for the upcoming winter are Dec. 21 to Jan. 5 and Feb. 14 to Feb. 23. Lift ticket prices for adults on Bald Mountain will be $69 during value season, while peak season will cost $105. Last year, adult lift tickets for a peak-season day on Bald Mountain cost $99. The regular-season dates are from Dec. 16 to Dec. 20, Jan. 6 to Feb. 13 and Feb. 24 to March 30. 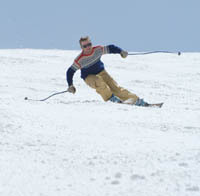 Regular season full-day lift ticket prices for senior citizens will cost $74 and $56 for children. During peak season, full-day lift tickets for senior citizens will be $79 and $59 for children. Regular-season, half-day lift tickets will cost adults $72, $55 for senior citizens and $46 for children. Peak-season, half-day tickets will cost $80, $60 and $51, respectively. Bald Mountain and Dollar Mountain are expected to open on Thanksgiving Day. For those looking for cheaper tickets during value season, full-day lift tickets for senior citizens will cost $54 and $40 for children. Half-day lift tickets will cost $59, $45 and $32, respectively over value season. For more information, call the resort’s lift ticket office at 888-490-5950, e-mail lifttickets@sunvalley.com, go online to www.sunvalley.com/tickets/lift-tickets or stop by the River Run Lodge sales office. During regular season, full-day lift tickets for Dollar Mountain will cost $60 for adults, $47 for senior citizens and $45 for children. Peak-season, full day tickets on Dollar will run $69, $52 and $49, respectively. For value season, the prices are $45, $37 and $35, respectively. The lift ticket prices for both Bald Mountain and Dollar Mountain compare favorably to Jackson Hole, Wyo., which charges $112 for a full-day pass and $90 for a half-day pass during the holiday seasons of Dec. 20 to Jan. 4 and Feb. 14 to Feb. 23. Value tickets for Jackson Hole cost $104 and $83, respectively, from Jan. 5 to Feb. 13. Regular-season tickets cost $106 and $85, respectively, from Feb. 24 to March 23. In Park City, Utah, full-day lift ticket prices will be $105 during the regular season, $68 for senior citizens and $67 for children. During the peak season of Dec. 21 to Jan. 3, full-day lift tickets will cost $107 for adults and $69 for children and senior citizens.